Continuing a month of shows looking at the connections between sequential art and literature, Alex Fitch talks to writers Matt Fraction and Michael Chabon about their friendship, reading experiences outside of graphic novels and mutual love of comics. Matt Fraction is an award winning writer who has become one of the most important contributors to Marvel's range of superhero comics, with runs on Iron Fist, Thor and Iron Man under his belt, his new assignment is the continuing adventures of The Fantastic Four and their extended family. 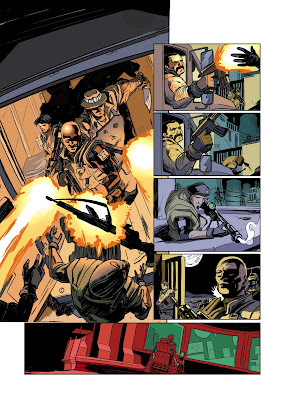 Fraction also has indie credentials from his ongoing European style spy series Casanova. 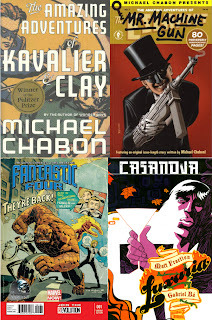 Michael Chabon is the Pulitizer Prize winning author of "The Amazing Adventures of Kavalier and Clay", a chronicle of the comic book industry in the middle decades of the 20th Century, which he continued in the pages of the comic book series The Amazing Adventures of the Escapist, that saw the author write his first comic book script, plus the publication of Will Eisner's final story to feature The Spirit. 2000AD continues its popular run of pocket-sized black-and-white reprints of Judge Dredd classics with The Judge Child - as the lawman leaves Earth on an intergalactic mission to save Mega-City One! When Justice Department’s oldest psychic has a terrifying vision of the future, Dredd and a select group of Judges are sent on a mission to find The Judge Child - an adolescent named Owen Krysler who may be the only being powerful enough to stop the foretold apocalypse. But at what cost? Featuring some of the most iconic moments in the strip’s history, Dredd encounters a galaxy stranger than anything you could imagine - from alien voodoo priests to spaceship-eating planets and diseases that make their victims disappear piece by piece! 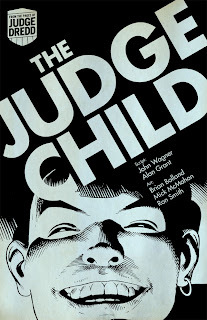 The Judge Child truly is Judge Dredd at its insane, imaginative best. 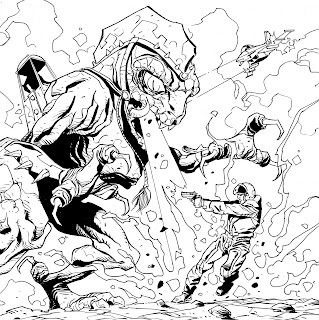 Referenced in both Judge Dredd films, this epic story also introduced the famous Angel Gang – including headbutt-happy Mean Angel, whose dial controls his level of aggression. 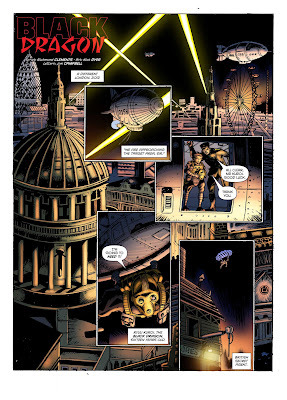 With incredible artwork by the greatest names to have drawn Judge Dredd - Brian Bolland, Mick McMahon, and Ron Smith - the latest in 2000AD’s line of Dredd stories in B-format is an all-time classic, a must have that will appeal to old readers and those unfamiliar with the world of Mega-City One. Pete Nash, creator of the long-running football strip Striker for The Sun newspaper, still has hopes the strip will jump from the printed page to TV. Answering fans questions on the StrikerWorld forum (membership required to view), Pete, who successfully secured sponsorship for the strip in the past, said that in order for Striker to be a real success, it needs to evolve from being just a newspaper strip. "It has been produced with 3D animation software since 1999 because I believe animation is the future for Striker, whether as a TV series or film," he said. "The costs are significant but I am optimistic it will happen before I kick the bucket!" 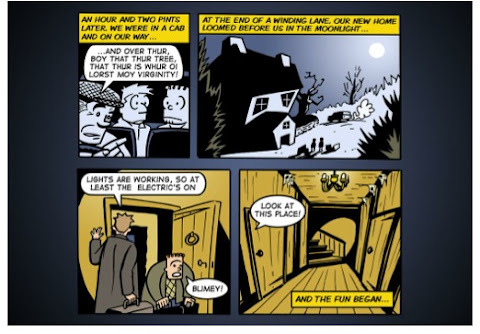 Pete Nash has been writing Striker since 1985, first as a line art strip for The Sun, then moving to its current 3D presentation. In 2003 he withdrew the strip form the paper following a dispute over intellectual property rights then launched Striker comic, which closed after an impressive 87 issues in 2005. Striker returned to the pages of The Sun, but it was dropped in 2009 and found a home in Nuts, then eventually returned to The Sun earlier this year. 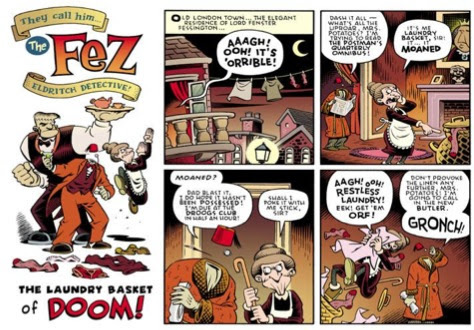 It's clear from questions asked that many fans of Striker were supporters of his attempt to turn it into a news stand comic and hanker for its return, but Pete knows this would be no easy journey, even with the ability to promote such a title through social media and with the online support and promotion by the stripe's many fans. "Production costs would only be lower if we operated as an online comic without a print issue," he argues. "Would an online comic have been profitable, or could it be? Who knows. The Dandy has ended its print run after 70 odd years but only time will tell if it will thrive online. 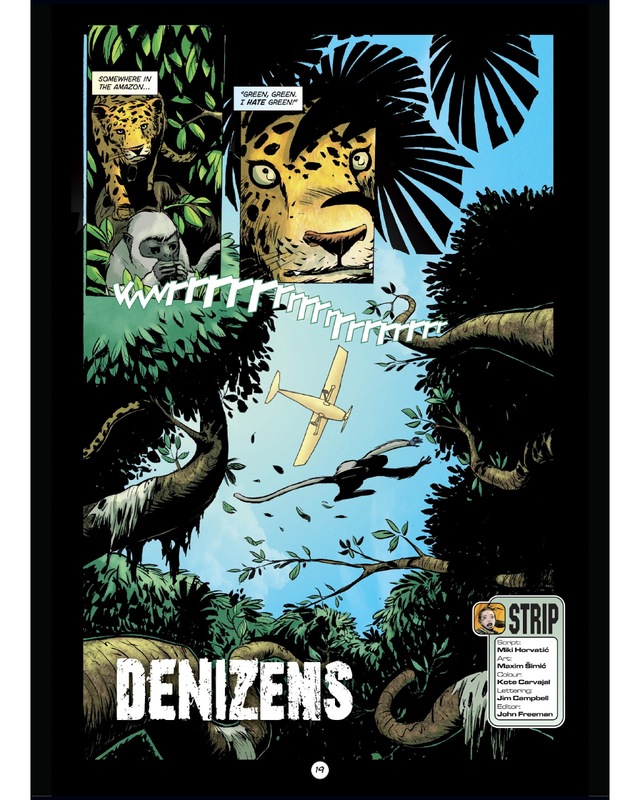 "Having said that, the online platform does offer opportunities in the areas you've suggested - for instance, one activity that will be launched in the near future is an iPad app and mobile app for past issues of the comic and newspaper strips. The overheads are quite low so hopefully this can generate some reasonable revenue, but we will have to see how they sell." At present, it seems really promoting the title online is a little hamstrung: Pete revealed "certain contractual issues"currently prevent him from forming an official website and Twitter feed or Facebook page – "but at least Striker is back in the country's biggest-selling paper and being enjoyed again by millions of readers. "One interesting aside about Facebook and Twitter is that Striker's return to The Sun generated thousands of posts and tweets around the country," Pete revealed. "It certainly shows the strength of Striker's appeal and following but it's frustrating that it's been so difficult to reflect that popularity with the emergence of spin-off activities. We must keep the faith, though! "For Striker to evolve creatively, more money needs to be generated. The Sun will be trying to generate extra revenue through new opportunities and possibilities so we will have to see how these develop." Pete also says he still hopes the whole strip will be collected, perhaps aiming for release in time for the strip's 30th anniversary in November 2015. Meanwhile, plans are afoot for new merchandise. It's clear he is still thinking long term about Striker, in terms of the strip and its possible adaptation in other mediums. Clearly a man who has fought long and hard to make the best of his creation, we wish him every success. Jason Quinn may not be a name familiar to many of our readers, but trust us, you'll be hearing more from him in the coming year. 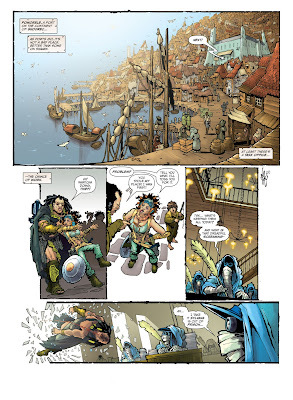 Progressing from comic writer to editor, to TV and back to comics, he's a man whose carved himself a steady creative career, 10 years of that based in Spain. 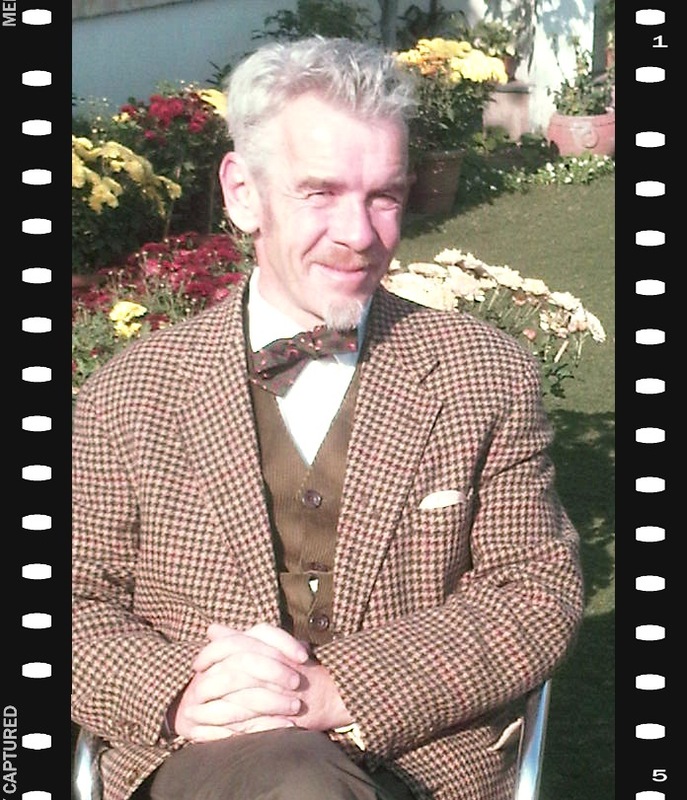 Now, he's moved even further afield - to Delhi, India, to become Creative Content Head at Campfire Graphic Novels. You might have come across some of their books in your local British book shop: mainly they've been classics, biographies, Indian mythology and a few originals, including Quinn's own biography of Apple co-founder Steve Jobs, Steve Jobs: Genius by Design, which is up for best Graphic Novel at the Third Comic Con India awards this coming weekend. (In fact, Campfire's up for a whopping 15 awards, which is pretty good going). "I learned to read with comics," he reveals. "In fact when I was little Iron Man used to come to my house at Christmas rather than Santa. I've still got the Fantastic T-shirt he left me when I was about four years old. "Yes, I loved comics right from the word go, but as a teen I wanted to be an actor so off I went to Drama School. I got kicked out after a year or so and did a few acting jobs: I played an Ugly Sister in Panto and King Henry II in Becket, up in Glasgow, amongst other things. Then I tried a bit of teaching English as a Foreign Language to bring in some extra cash. I hated it and so I badgered my brother Tim, who was working for Marvel UK at the time, to get me an interview. And lo, I was taken on and became editor of Barbie magazine and the Care Bears. "I survived the cull at Marvel UK when we became Panini and went on to become Project Leader and Chief Sub, responsible for the short-lived classic Football Crazy, Quiz Mania and Fun Song Factory. Actually, it was while I was project leader that we brought out Spectacular Spider-Man, Essential X-Men and Astonishing Spider-Man, all of which are still going today, or they were last time I looked. "Anyhow, after a while, I was approached by a kids TV company at Pinewood Studios and asked if I wanted to join them as head of creative, so off I went to the home of James Bond. (Pierce Brosnan actually bummed a cigarette off me on one occasion). Then, when my kids were at school, we decided one day to leave the rat race and head for Spain where I hoped to pick up a fair bit of freelance. I'd been doing the odd job for Panini, such as the UK Spectacular Spider-Man series. downthetubes: You've had a quite a varied career as a comics freelancer but moving to India is quite a leap! How did that come about? It is a leap. It's madness but I love it. I first came out to India a little over a year ago when we were working on the Steve Jobs book and I fell in love with the place. Not with India per se, though Delhi is awesome, but with Campfire. It really was like Marvel UK used to be, complete with its artists downstairs beavering away. It was a mad hive of creativity and I loved it. When the directors asked me if I would be interested in joining I jumped at the chance. My kids were growing up. One had left home and to be honest, freelancing can get lonely. I wanted to be surrounded by creativity and this was a pretty good place to do it in. So off I came a couple of months ago. downthetubes: How did Campfire come about, how long has it been publishing and what does it publish? Campfire has been publishing for over five years now. It all came about when our founder, Mr. Keshav Thirani was spending the holidays with his grandsons and they were bored and wanted something to read. The comic books they had weren't up to much and so... he thought to himself, we could do better than this -- and so Campfire was born. downthetubes: What is your role at Campfire? My official title is Creative Content Head, so basically I oversee the creative side of what goes into our books, liaising with editorial, art, marketing and the directors. I'll go over the scripts, choose writers and artists, and have a say in what titles we will be producing or not producing. downthetubes: How big is the Indian comic market and who reads comics? In India, although comics have been around for a while, the market is relatively small but growing all the time. I remember my brother bringing back some comic books based on the likes of Krishna and Ganesha back in the early 1970s so while comics aren't new, people are only recently beginning to really catch on to them as fan bases are growing all over the country. We're off to the third India Comic Con in Delhi this week and that's getting bigger all the time. They also have big events in Mumbai and various other places throughout the sub continent. downthetubes: What are your most popular titles - some of which have gotten critical acclaim and awards? I'm going to blow my own trumpet and say Steve Jobs: Genius by Design. It's done very well both here and abroad and it's up for three nominations at Comic Con this week. Best Graphic Novel, best writer and best cover. 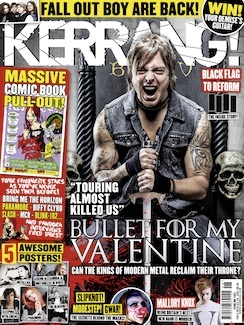 The cover is pretty cool. The book is shaped like an iPad and well, the writing is incredible. For younger readers, our adaptation of The Jungle Book won best art at Comic Con India last year and our biography of Nelson Mandela, Nelson Mandela: The Unconquerable Soul, won best graphic novel. They're all pretty good. downthetubes: What kind of projects are you looking to publish to extend the Campfire brand beyond its current catalogue? So far we have specialised in adaptations of the classics, mythology both Indian and Greek, biographies and a handful of originals. We are always looking for exciting new ideas, and have a few good original series lined up, including sports (Think Tiger and Roy of the Rovers), historical, adventure and anything that we think could be commercial and exciting. I can't go into too much detail about our upcoming programme just yet but I will be sure to keep you informed. Let's just say that I'm really excited about our sporty one, because I was a massive fan of Tiger as a kid. And of course we have some pretty cool new graphic biographies too and a popular adaptation of a classic that will hopefully become a must have item for girls and women all over the world. Actually, that is the key for our future books. I want them all to be must have titles. 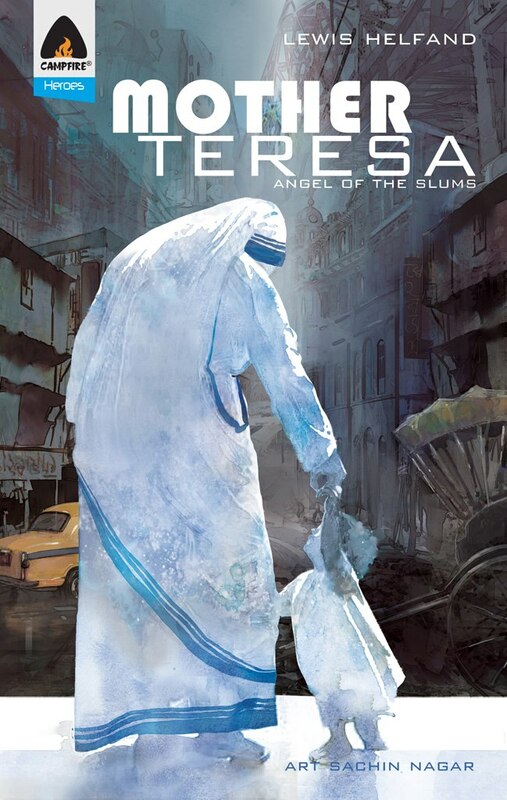 Mother Teresa: Angel of the Slums, our latest book [which is officially released in May], is being launched at Comic Con India this week - and once you see the artwork for this you'll be blown away. Every page is a real work of art that you'd want hanging on your wall. I cut up the proofs and have them hanging on my wall now. Sachin Nagar is the artist and he's one of the brightest talents I've ever worked with. downthetubes: Will all your creators be Indian or are you looking for projects from abroad? Is there a Campfire submission guidelines page on your web site? It's true I want to encourage more Indian writers. All of our artists are Indian and usually work in house. 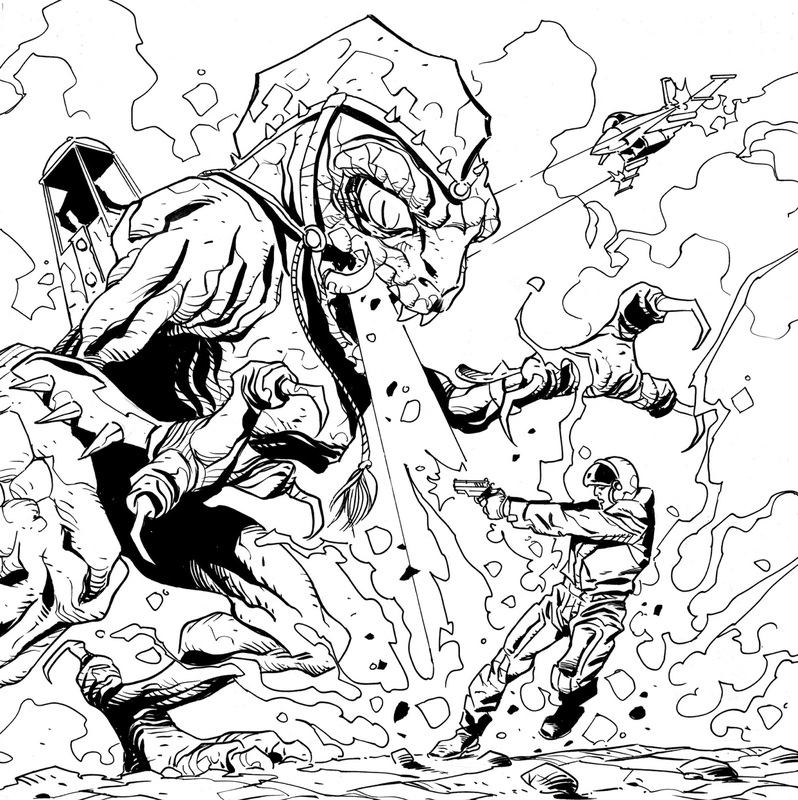 That said, we do occasionally commission out work for cover artists. But as for writers, they come from all over the globe. We're revamping the website at the moment and a submissions guide will be up there. In the meantime, we are always on the look out for talented writers, preferably with some experience in writing comics. If anyone is experienced, and either has an idea they want to pitch or wants to be considered for any commissions on our biography, mythology or classics lines, feel free to drop me a line at jason@campfire.co.in. That said, don't get your hopes up too high that we will publish your great idea, any ideas have to run the gauntlet of me and the directors and fully answer the question 'Why should we publish this?' Alas, 'Because it's great' isn't a good enough answer. We need to know it's going to sell too. After all, we're not in this just because working in comics is a great way to meet and impress girls, we've got to eat too, now and again. downthetubes: What kind of comics do you like to read? I still love the same stuff I read as a kid. I love revisiting the old Stan Lee classics. My favourites being The Avengers. I also love The Spirit, anything by Dudley D Watkins, my old Action collection (Dredger, tough as old boots, is an all time favourite) and more recently, at least in this century, I've enjoyed Hitman, KickAss, Joe Sacco... and the list goes on. downthetubes: Which three Campfire titles would you recommend to those unfamiliar with company's range? Hmm. 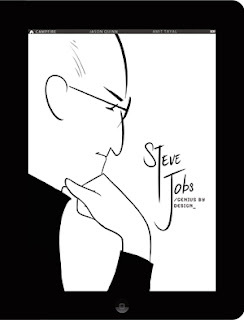 Well, the Campfire Age is really just beginning but a good current sample of our range at the moment is Steve Jobs: Genius by Design (yes I'm blowing my own trumpet again - someone has to! 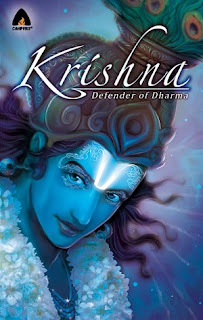 ), Krishna: Defender of Dharma (which has stunning art and is a great introduction to Krishna, who is quite a tough cookie as he comes up against monsters, demons and you name it), and The Strange Case of Dr. Jekyll and Mr. Hyde from the classics range. You can't go wrong with that. Oh, and one more, Ravana: Roar of the Demon King. 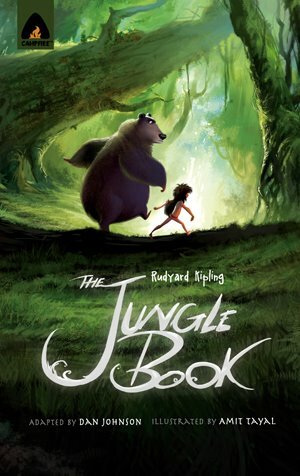 It's based on an other old Hindu tale and the art with this is incredible. downthetubes: What one piece of advice above all others would you give an aspiring comic creator seeking to break into the comics industry? Who wants to listen to what I've got to say? Not me, that's for sure. Actually, these days it is really tough, so I would say persevere, put yourself out there and be prepared to write about anything, not just your own pet projects. Believe me, you can make yourself fall in love with just about any subject, especially if you're being paid for it. The other thing is that the more projects you work on the better you get. I look at some of my earlier stuff (most of it, actually) and I cringe now. Be prepared to write about anything and the chances are before too long you'll eventually end up working on your dream book. Now, in the meantime, look out for Campfire and pick up a copy of Mother Teresa: Angel of The Slums when it comes out, believe me you won't regret it. Graphic Novels! Melbourne! UK Premiere Screening! Following its European premiere at the 40th Angoulême International Comics Festival, the brilliant new documentary movie Graphic Novels! Melbourne gets its UK premiere in London on Wednesday 13th February, at a special Comica Festival screening, supported by the Australian High Commission. Co-directors David Hayward and Bernard Caleo will be in London to introduce their film. Over the past five years, graphic novel publishing has arrived in Australia, and it is overwhelmingly based in Melbourne. In Graphic Novels! Melbourne! we meet theartists and the publishers of this new phenomenon in Australian book publishing.The film investigates the comic book community of Melbourne, out of which thegraphic novel artists have grown. The city and suburbs of Melbourne feature asbackdrops against which the film, the artists and the graphic novels are set. As partof this documentary, we witness comic books in Melbourne entering universitystudies, literature festivals, and art galleries. Graphic Novels! Melbourne! uncovers an energetic, diverse and productive comicsculture on the streets of Melbourne. It investigates the life and work of four local graphic novelists in particular: Pat Grant, Nicki Greenberg, Mandy Ord and BruceMutard. 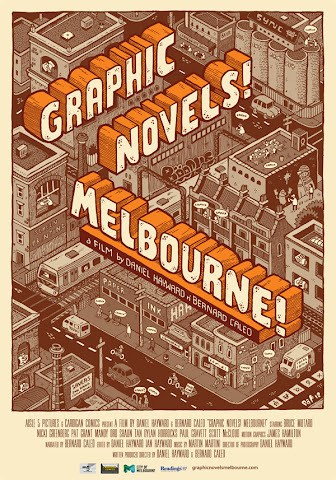 There are also interviews with four international comic book luminaries:Scott McCloud, Shaun Tan, Dylan Horrocks and Paul Gravett, all of whom lend theirperspective to the development of comics culture in Melbourne. • Graphic Novels! Melbourne - Wednesday 13th February, The Anatomy Theatre at School of Arts & Humanities at King’s College, The Strand, London WC2R 2LS. Doors open 7pm for a 7.20pm start. To book your tickets at £5 each, please send an email to give your name and how many tickets you would like, and we’ll confirm by return. Some tickets will also be available on the night, on the door. STRIP Magazine is heading for the UK news stand at last - with a launch date of 28th March 2013. 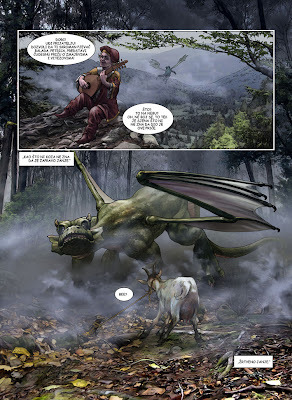 While the move to get the magazine into WH Smiths and other stores has been delayed several times, Bosnian-based comics publisher Print Media seems confident it has overcome its delivery issues and its owner, Ivo Milicevic, says he is ready to bring the adventure anthology to newsagents is finally underway, after a “test run” of seven issues in UK comic stores. 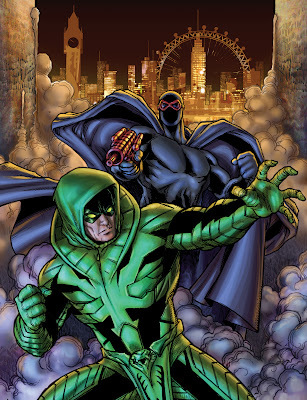 The line up of the monthly anthology magazine will be a mix of action adventure, science fiction and fantasy strips, alongside feature material about the world of British comics, including the continuation of Black Ops Extreme, centred on a secret anti-terrorism team; Crucible, a creator-owned story described as “science fiction - with swords!”; teen heroine thriller, Warpaint; and the return of 1970s action hero King Cobra, in all-new stories, under license from original publisher DC Thomson. Creators in the launch issue include Jim Campbell, Richmond Clements, Stephen Downey, Nick Dyer, John Freeman, Phil Hester, Miljenko Horvatic, John McCrea, Wamberto Nicomedes, Maxim Simic and Smuzz. Continuing the adventures of a covert military unit taking on terrorists across the globe - but facing its own troubles with a possible traitor in its midst! A homeless teen finds herself drawn into a cataclysmic struggle between mankind and elemental monsters bent on the destruction of our world. British and French steampunk spies take on the might of the dangerous Prusssian Empire in a feature-length adventure starring teen ninja Black Dragon! Spurred by personal tragedy, humanity’s very existence is threatened with destruction when fast-growing plants are released, wiping out all organized centres of civilisation! Strips in the pipeline include Dragonrir, a stunning fantasy tale by Miljenko Horvatic and Damir Zitko; a thrilling story of the criminal underworld, Deliverer, by Miljenko Horvatic, drawn by Bernard Kolle; WarWorldz by Stephen Walsh and Giancarlo Caracuzzo; the tale of an ancient warrior battling magic, Thracius, by James Hudnall and Mark Vigoroux; plus the return of other strips, including Age of Heroes by James Hudnall and John Ridgway and The Devil's Heritage by Jerome Felix and Paul Gastine. "I am really excited our plans for STRIP Magazine are finally developing as I planned three years ago" says publisher Ivo Milicevic. "There is no certain formula for success, but the Magazine will have some good stories and really great art. Ivo, who grew up with British comic characters such as Black Archer, Steel Claw and The Spider, which were reprinted extensively in former Yugoslavia, has been working in publishing for nearly 25 years. After college, he worked as journalist, and later as a publisher. Print Media's business centres on print for the comic industry. Complementing the re-launched magazine will be more UK comics albums, adding to its current titles - Iron Moon, Frontier and Mirabilis. 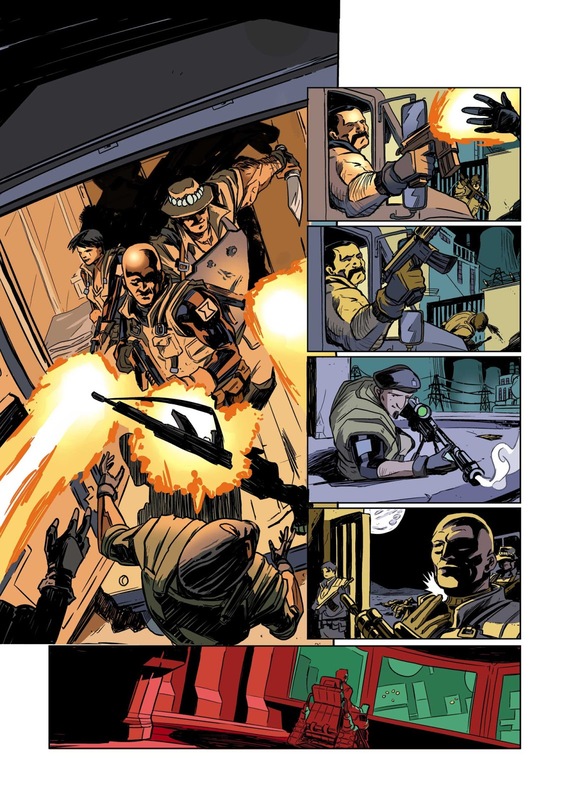 Plans include collections of some of the strips published in the first limited edition run, including Black Ops Extreme, drawn by PJ Holden. 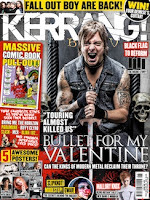 Ace cartoonist Steve Beckett has landed a new comics commission – in the first Kerrang Komic, published as part of Britain's top selling Heavy Metal music magazine. On sale today, Steve is drawing Muse, who become the victim of their own stupidity. 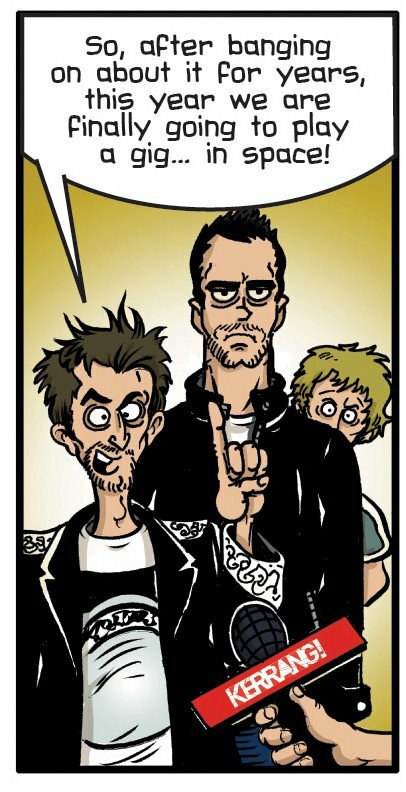 The massive comic section includes all many music stars as you've never seen them before, including Bring Me The Horizon, Blink-182, My Chemical Romance, Slash and Biffy Clyro. Edited by James McMahon, other comic creators involved include Sarah Burgess, Marc Ellerby, John Grieve, Ben Holliday, Phillip Marsden (drawing the MCR strip, about their pet unicorn), Julia Scheele , Jon Scrivens (who provides the cover of the comic), Neil Slorance and Simon Young. new Oscar’s Orc Army for TOXIC magazine. A call for papers for a forthcoming conference on Conflict in Children’s and Young Adult Fiction at the University of Bedfordshire has just been announced - and comics and graphic novels will be on the agenda. The Hockliffe Conference: Conflict in Children’s and Young Adult Fiction is a one-day conference on 6th September 2012 at the University of Bedfordshire, Polhill Campus, Bedford. Writers of children’s and young adult fiction have never shied away from writing about conflict faced by children whether it’s the conflict of a world war in The Silver Sword, published in 1956, or inter-tribal conflict in East Africa in Little Soldier (1999) – both explored at last year’s exhibition, ‘Once Upon a Wartime’, at the Imperial War Museum – generational conflict such as that experienced by Mossy Trotter (1967) or intra-racial conflict faced by the eponymous Rani and Sukh in Bali Rai’s book (2004). All children face conflict at some time in their lives and this conference explores the way in which this is represented in children’s and young adult fiction. The keynote speaker at the conference will be Bali Rai. Born in Leicester, Bali Rai writes about the harsh realities faced by children and young adults and his books have been short-listed for a number of awards including the Booktrust Teenage Prize. His third novel, Rani and Sukh, is now a GCSE set text. This list is not exhaustive and abstracts dealing with any form of conflict will be considered. Abstracts of 250 words for 20 minute conference papers should be sent to the organisers as a Word attachment to (hockliffe@beds.ac.uk) together with a brief biography by 19th April 2013. Presenters will be notified by10th May 2013. The conference is titled the Hockliffe Conference in honour of a local bookseller, Frederick Hockliffe, whose son donated his collection of early children’s books to what was then Bedford Training College in 1927. This comprises over a thousand rare books dating from the late seventeenth to the early twentieth century, mainly between 1740 and 1840. Its importance is indicated by the fact that it formed the basis of a major research project, funded by the AHRB, between 1999 and 2002. The website for the collection is currently housed at De Montfort University, in the Centre for Textual Studies, and was most recently reconfigured and updated in 2012 (http://hockliffe.dmu.ac.uk). In 2010, the Collection was augmented when Hockliffe’s granddaughter made a further donation of books from her own collection. The University also holds a collection of over 200 copies of versions of ‘Cinderella’ which was donated to the Library in August 2012. Most are from the twentieth century, but about half a dozen are rare nineteenth-century editions. This wonderful collection of copies of the most popular of all fairy stories (first published in English in 1729, but of much more ancient origin) further enhances the position of the Library as a leading resource for the study of children’s literature. A new title highlighting British comics talent is currently in pre-production, and set to launch later this year. The line up will include the work by creators such as Cy Dethan, Amrit Birdi, Graeme Howard, Russ Leach, Peter Mason, Cheuk Po, Pete Rogers, Matthew Soffe and Nic Wilkinson. This post marks our 4000th blog post since deciding to create a separate 'news feed' for our main site www.downthetubes.net. 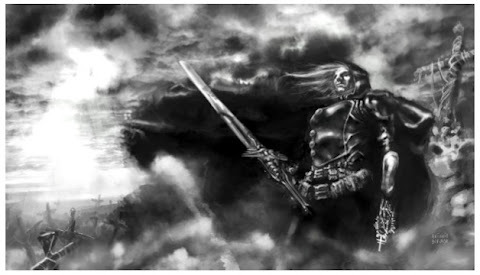 (This blog 'feeds' into our main site and forum, presenting news from a number of contributors via Google's Blogger, in a way that simply enabled me to bring on board some fantastic writers about British comics that didn't involve complicated Content Manage Systems and other bells and whistles I don't have the technical skills - or time - to implement). downthethetubes has been dedicated to covering British comics since 1999, back when there were few comic sites covering anything except US superheroes and their like. As you'll see from the "Blogroll" we feature, that has changed somewhat, with dedicated fans such as Steve Holland bringing us Bear Alley and Lew Stringer giving us six wonderful years of his now-on-hiatus Blimey! It's Another Blog About Comics. Down the years, we've had contributions from many a British comics fan to the cause of promoting British comics and creators, but I'd just like to thank Jeremy Briggs in particular for his dedication and input behind the scenes on this site, quietly correcting my mangled, often perhaps too hastily written posts. His contribution to this blog has helped build it into a blog that now gets some 40,000 visits a month. There's still more that could be done and we (of course!) welcome contributions from others, and folk such as Matthew Badham, Norman Boyd, Ian Wheeler, Richard Sheaf, Steve Winders and others have all provided us with news items I may have quite otherwise missed if not for their support. A big thank you has to go out to the independent creators and British comic publishers for their support of our efforts, sending us information that has all helped in our attempts to promote British comics. I'd also like to thank those of you who have, on occasion, donated sums toward our operating costs to pay for the hosting of our main site and forum and our current sponsor, digital comics publisher Panel Nine, who saved us from going on hiatus ourselves last year. Finally, the biggest thank you goes to you, to the most important part of this site and blog - our readers. The Book: A history of the famous Lion weekly, which ran from 1952 until 1974. 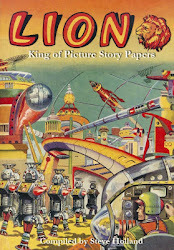 Steve Holland tells the story of Lion’s creation and development in four detailed chapters, before proceeding to catalogue all the strips, text stories and features in the weekly, the annuals and the Summer Specials, with publication dates and remarkably full details of writers and artists. The book is fully illustrated in black and white, with individual pages from every continuing strip in the weekly. The Review (by Steve Winders): Unlike its more famous contemporary, Eagle, which has spawned many books, this is the first work devoted to Lion, a paper which began as a much inferior rival to Eagle, but which steadily improved through the 1960s as Eagle declined and was eventually absorbed by it in 1969. 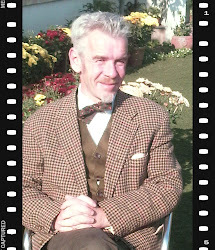 Author Steve Holland is a comics enthusiast of long standing and has gathered his information together over many years. Consequently it is accurate and highly detailed. (I spotted just one inconsequential error in the whole book and that was not about Lion, but Eagle, which moved to web offset printing in September 1967 and not January 1968). His narrative explores the successes and failures of the paper and examines the contributions of editors, writers, artists and strips. He also provides details of sales figures and management changes, which were so important to the direction that the paper took. Following the narrative, the book features short interviews with the paper’s first editor, Bernard Smith and with Barrie Tomlinson, who worked on Lion early in his career. These are followed by the full and detailed index of all Lion’s contents. I was surprised by the large number of characters who appeared in Lion over the years. These include the familiar favourites Captain Condor, Robot Archie, Zip Nolan, Paddy Payne, The Spider and Adam Eterno, as well as the more obscure Red Knights of Morda, Oddball Oates and The 10,000 Disasters of Dort. The book may seem expensive, but this is a specialist publication with a limited print run, published by the author and designed to appeal to the dedicated fan. It serves as a reminder that for all the many and varied books that have been written about Eagle over the years, none has explored its whole history in such detail. I have no hesitation in recommending this informative book. Aces Weekly, which showcases some of the brightest new and established talent from across the globe in an exclusively digital weekly comic art magazine, begins its seven-issue, seven-week runon Monday 4th February. Volume Three of the revolutionary digital comic art weekly created and published by David Lloyd, features a further seven-week installment of Mark Wheatley and JC Vaughan’s, fantastic Return of The Human; Roger Langridge’s Fez; Antonio Bifulco and Giuseppe Rungetti’s Warrior Exorcist; Steve Marchant's Six Minutes Past Midnight; and a hymn of hope and a very special tribute to New Yorkers from the great creator of the Third World War series Seth Tobocman – One City. • If you'd like to know any more about any of this great stuff coming up from the title, and why they all love doing it, David Lloyd will be at Paris Manga (www.parismanga.fr) on February 9-10th with some of the Aces Weekly crew - Yishan Li, Kev Hopgood and Rory Walker - at booth 100. Our brothers in arms in the Commando office in Dundee are rather keen on their Facebook page and, as well as posing questions and giving out information on their titles, they have a extensive collection of Commando covers in their photo section in addition to a selection of photographs that they have either used as references for Commando artists or simply unusual military photos that they have come across. They have recently added some initial pencil sketches for Commando characters and covers - and two of the issues the cover prelims are for are amongst the current batch of four Commando comics in the shops at the moment. 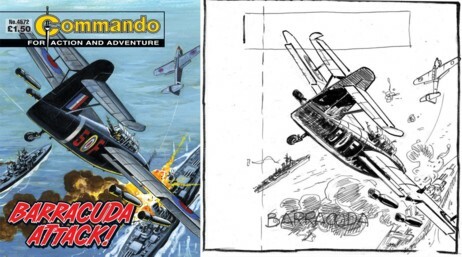 Issue 4572 is Barracuda Attack!, written by Bill Styles and with internal art and cover by Carlos Pino, and we have to say that Pino has found an angle on the Royal Navy Fairey Barracuda dive-bomber that almost makes this very ugly design of a plane look good. The other cover prelim is for the current story in the Alan Hebden's Convict Commandos series, issue 4571 Frenzy Of Fear. 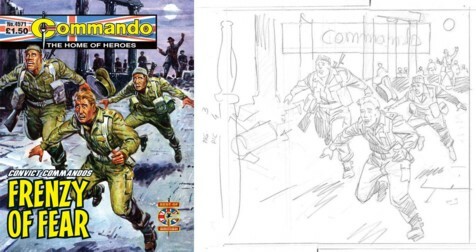 Artist Benet, who did both the internal and cover artwork, shows the commandos running from a German unit and, looking at his cover prelim, it is worth remembering that Commando cover illustrations are square and therefore wrap-around onto the back cover of the comic where they meet the back cover image of the "Commando Dagger", the Fairbairn–Sykes fighting knife. 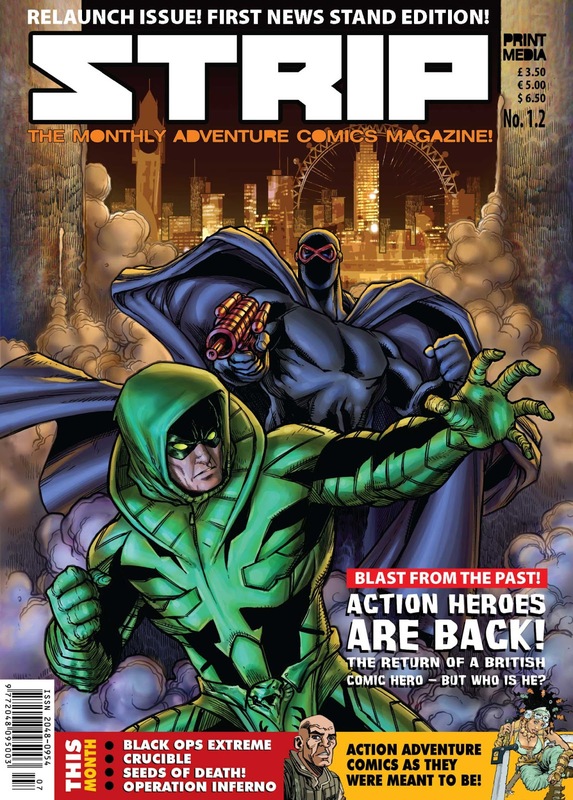 Both these issues of Commando are currently on sale in WH Smiths, Easons and other High Street newsagents. There are more details of Commando on their official website and Facebook page.